The Chester Made initiative is a tangible demonstration of how democracy can be animated by imaginative humanities programming--by people creatively engaged in history, storytelling, and dialogue about issues affecting their community. 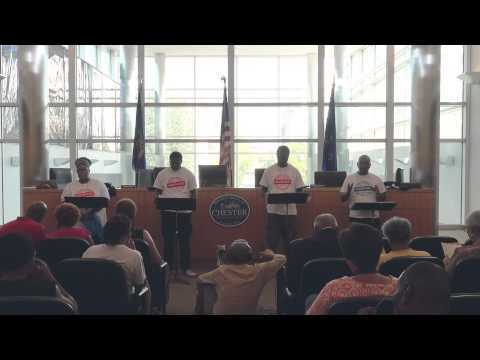 The initiative reached a culminating moment on July 22, 2015, when the Chester Made Ensemble made a presentation to Chester City Council in the form of an original play and a cultural asset map. The presentation attracted press attention, including an evocative radio and web report by WHYY's Newsworks team, which also appeared on the Keystone Crossroads site and inspired a Nonprofit Quarterly feature. "Instead of just creating a two-dimensional map based on research and surveys, we used storytelling and theater as a way to capture the data to go on the map," ensemble member Lamarr Todd said to begin the presentation. "In this way, we were able to use community voices and experiences as the heart of the map. Stories are data with soul,” added his colleague Don Newton. In February 2015 eight story-gathering sessions, facilitated by the Chester Made Ensemble, were held throughout Chester. More than 350 residents participated, sharing 140 stories about the creative and cultural life of their community. During the sessions, the Chester Made Ensemble brought residents’ stories to life through gift-backs, spontaneous acts of improvised theater. Residents also had the opportunity to situate their stories in a physical context, by placing colorful sticky notes on a poster-sized map of the Chester Cultural Corridor. In July 2015 Widener University students analyzed the stories and, together with the Chester City Planning Department, The Artist Warehouse, and the Pennsylvania Humanities Council, created an online ESRI cultural asset map, marking places of significance across the city. The map is both a visual celebration of creative life and a visioning tool. To paraphrase Don Newton, it is data with a soul. The process of cultural mapping is never done. There will--and should--always be new information and assets to add. The work to date on the Chester cultural asset map, however, has established a solid foundation. AUDIENCE MEMBERS IN THE PACKED CHAMBER LISTEN INTENTLY AS THE COUNCIL DISCUSSES BUSINESS AND INTRODUCES THE CHESTER MADE ENSEMBLE. THE CHESTER MADE ENSEMBLE PRESENTS THE FINDINGS OF ITS STORY-GATHERING SESSIONS THROUGH A THEATRICAL PERFORMANCE. MAYOR LINDER WITH CHESTER MADE ENSEMBLE MEMBERS. GET CHESTER MADE ON THE MAP! Chester Made project partners include the City of Chester, Widener University, Pennsylvania Humanities Council, Chester Arts Alive, Just Act (formerly Gas & Electric Arts), The Artist Warehouse, and Americans for the Arts. Major support of the Chester Cultural Corridor has been provided by The Pew Center for Arts & Heritage, with additional support from PECO and the National Endowment for the Humanities.